Dutch duo of Coen and Lars follow up their critically acclaimed Ribbels 12″ with 20 minutes of post drum and bass reflections. Fragmented piano figures, acoustic guitar and a swingtime marching band all poke their heads up, while a keen pop sensibility holds it all together. 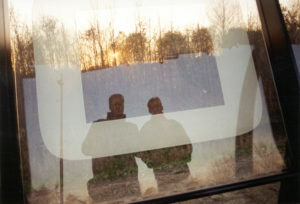 This is rural electronics for the romantic soul. Absolutely tuned in! 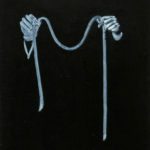 Klonten was originally released on a 3″ cd-r on Scarcelight Recordings in 2003. 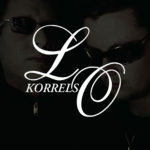 This digital release contains the bonus tracks kaalslagerin and hersenvocht, which were originally released on the Gone Bald 10 Year Anniversary compilation cd on june 11 2004. Questo split ha solo un difetto, quello di tutti gli ep: dura troppo poco. Appena 20 minuti e qualche manciata di secondi. L’incomprensibile mormorio introduttivo di Chriettitulear sembra trovar prosecuzione nell’intreccio fra breaks che ricordano quelli in uso nei primi novanta, una melodia al piano “inzaccherata” col pitch, percussioni simili a campane effettata con l’echo a iosa, che confluiscono nel breve ipnocrepitio di aartstaartjes, parentesi che precede “diewertjeblok” (l’adozione di questa friggitoria di suoni per marcare i passaggi da un setting ad un altro è cosa frequente di recente – in Everlasting Blink dei Bent per esempio se ne fa un uso sovrabbondante-), che in tre minuti condensa una marcettina swing su suoni aereocriptici alla Simonetti. Pennellate orrorofico-psicotiche che i Living Ornaments sembrano predilire anche nella sordida edwinrutten o nella sbilenca chitarra unita ad un didgeriviolino (un violino che in alcuni passaggi suona come un didgeridoo) in hanpeekel. Ascoltando harmensiezen ci si può chiedere se il duo olandese (all’anagrafe Lars Meijer e Coen Polack) non si sia ispirato al robot alcolizzato dei Groening o viceversa. 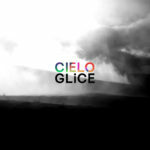 Lo sbiascichio elettronico di questa traccia prosegue in henkmouwe, che chiude questo split in una cornice di brulicanti solletichii di tickles. 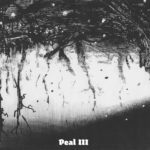 Nonostante il fatto incontrovertibile che le scelte stilistiche non andrebbero messe in discussione, forse il disco -pubblicata dalla Scarcelight di Chris Jeely (aka Accelera Deck)- difetta nel set percussivo riconoscibile e un po’ attempato. Ad ogni modo le atmosfere evocate sono nel complesso molto suggestive. Living Ornaments är en holländsk duo som, förutom att spela in musik i sovrummet, även driver skivbolaget Narrominded. Amerikanen Chris Jeely (mer känd som Accelera Deck) var med på ett split-album som släpptes på detta bolag i somras. För att återgälda vänligheten har Chris nu låtit de två holländarna släppa denna EP på hans eget bolag, Scarcelight. Skivan börjar med lite trippig light-drum’n’bass. Fjäderlätta trummor vilar en bit ovanför lite billiga analoga syntljud och sporadiska gitarrackord. Mycket shoegazer-känsla, men det funkar riktigt bra och skivans sju låtar utvecklar sig snyggt vidare med mer knastriga utflykter över 20 minuter. Vid ett tillfälle med något som låter som en trummaskin som inte lyckas få tillräckligt med ström ur sin strömförsörjning. Fragment av akustisk gitarr, piano och plonkande på ett evigt växande berg av odiskade kökstillbehör interagerar snyggt med mer modernt transformatorsurr. Och även om skivan inte är något jag kommer att återkomma till särskilt regelbundet, så är det ändå riktigt roligt emellanåt. “Chriettitulear” rings through your ears, by dropping a garbled mulched vocal which welcomes you to the party, just in time for the beat to rattle its way in. Spiralling beat strikes are smoothly layed over a warm piano meldoy, which gives off an eastern vibe. It makes you vision a small electronics market, deep within the side streets of a major city, the light bussle of the crowds mixes with the murmurings given off from the power surging all around. Good stuff. 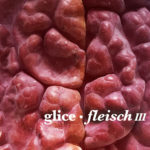 Super processed glitch crunch beats drag and scratch you into “diewertjeblok”, crazy track names all around. Developing in the background, an amiga style theme tune gives out a supressed call through the haze of electronic fuzz that has created itself all up in the place,listen carefully and concentrate. “Edwinrutten” is an acoustic lightshow blowing up behind your eyes, its a one man party, and guess what, you are not invited. As buckets of static pour down the icy building, thudding beats bounce along in time to the visuals, but who is attempting to speak to you through the distortion? You will have to find out yourselves. Atmospheric storylines in a track. Cool. “Harmensiezen” drops you into the mindset of a drunken courtesy droid, if only he hadnt had that last Sump oil and Redbull he would have been ok, but its chaos inside his small aluminium face. Listen in and try to help. “Henkmouwe” is the droid waking up the next morning, his sensors overloading, as his tiny processor attempts to recollect what happened the night before. Barraging data slides into place, as waves of fuzzy static reel into the microphone port, giving off a squeaky microscopic animal like call,but its ok, the information is all slotting into place. That will teach you, naughty robot. ‘Klonten’ is a tiny experimental journey through the plastic speaker house that Living Ornaments live in. Full of life and put together with tiny glowing chopsticks,the intricate craftmanship is all good. Definetly worth tracking down. 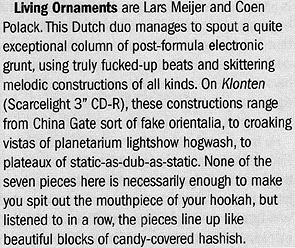 Living Ornaments are an electronica duo comprising Netherlanders Lars Meijer and Coen Polack. Their two releases under consideration here are their own EP, Klonten which clocks in at a little over twenty minutes in length (blink and it’s gone) and their half of a split LP. Klonten is an interesting, if too-short release. There seem to be a number of different tracks wriggling around inside Chriettitulaer (this is a good thing). There’s a reggae-ish dub spirit spiralling in the background, a stuttering, mutating biscuit tin drum and bass beat, abstract figures skating around and from time to time an upbeat melody perambulating throughout. 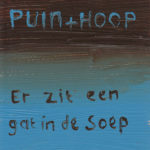 Diewertjeblok darts and fizzes along before sloughing into a contemplative phase and running out of steam. Shorter tracks alternate with longer tones. The mixture of acoustic and electronic sounds is interesting; particularly the melancholic piano and associated chimes and strums on Henkmouwe. At times though there is something of an apprentice tentativeness to this EP. 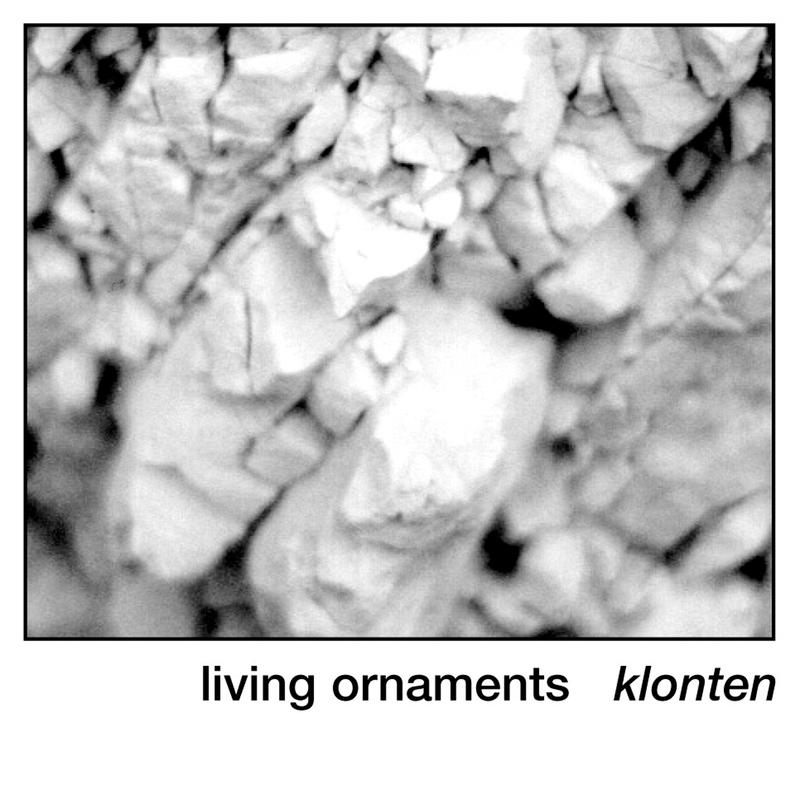 Some of the drum sounds appear a little pre-packaged and disposable and it would be good to hear the duo explore their ideas over longer periods of time, but Klonten is a promising and interesting release. On their part of the Narrominded Split LP release (the other half contains tracks by Accelera Deck), Living Ornaments present 11 tracks ranging between thirty-one seconds and three-and-a-half minutes long. Oliespatten navigates a number of different stages ranging from up and down pacing to headlong dash. The shorter tracks mix sudden, almost comic pianistic interruptions wrapped round with electronic noise like poison ivy binding a graveyard statue. There’s a strong episodic and filmic sense to the music. At times the music resonates with the sound of celestial bodies echoing down the light years, at other times the sound of synthetic vegetation buffeted in high winds. 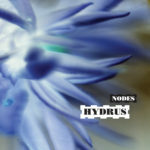 Crunchy, pummelling rhythms agitate and overlap with each other. Kwalrups breaks up in free fall, its signal lost in Geiger noise. There is a hint of the deep space music of the mid-nineties (think of Pete Namlook¹s collaborations with The Higher Intelligence Agency), though the rhythmic timbres and structures are entirely contemporary. I don¹t know which of these releases came first, but I wouldn’t hesitate to confirm that the Narrominded release follows Klonten. The band’s sound appears much more confidant, more detailed and more solid and they seem to be pushing things a lot further. Worth searching out. On the new Scarcelight Recordings label, with all the 3″cdrs in these simple but artistically fascinating black and white covers, you just know it’s going to be good. Someone has seen enough wonder in the work to put it in front of you in the simplest terms. 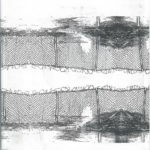 Part Idm, pulsing, minimal and ambient, seven tracks patter and sweep elegantly along, threading themselves together with inventive melody and loops. Amazing that something so remarkable gets put out on a little 3″ cdr. There are labels that wrap mega-expensive packages around sounds not nearly this stimulating. A glossy, pretty booklet never makes you put that cd in four years after you bought it. Excellent for people into 310, David Kristian or Porter Ricks. 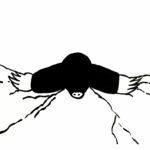 Pour sa onzième réalisation, le label néerlandais Narrominded débute une série de split LP vinyle (un ep par face), accueillant pour cette première édition… Lui-même, à savoir Lars Meyer et Coen Polack, fondateurs de la structure, sous le pseudonyme Living Ornaments, et l’américain Chris Jeely aka Accelera Deck (Morr Music, Rocket Racer, 555…), lui-même fondateur du label Scarcelight. Living Ornaments s’octroie la première face du bel objet : 11 titres assez courts d’une electronica fortement perturbée, élevée à la drum’n bass maladive, aux nappes sombres et aux ruptures structurelles conséquences. Riches de sons divers, de grincements ferroviaires en larsens et drones protéiformes, leurs complaintes glacées, qu’éclairent parcimonieusement d’éparses notes de piano, sont le gage d’une dépaysement post-industriel intense. De son côté du disque, Accelera Deck n’offre que quatre titres mais aux durées plus courantes. Le premier, Feedback Song, est un immense larsen de guitares pulsé par une laptop. Effet nettoyant garanti. Après un morceau plus calme, les douze minutes de Spangle s’étalent sur une nappe ambiant et bruitée nourrie de souffles et de larsens. Qui finira par s’évanouir pour laisser place à quelques accords de guitare folk, qui était finalement la seule source de tout le bazar bruitiste entendu jusqu’à lors. Tim Hecker n’est pas loin. Fennesz non plus d’ailleurs. En forme de digne retour des choses, c’est Scarcelight qui publie Klonten de Living Ornament, court ep 3″ riche en morceaux grandioses. Chiettitulaer est, en ouverture, un titre largement plus mélodique que ceux de split lp. 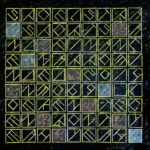 Ambiances sévères et bruitées, entre Third Eye Foundation ou Downpour et electronica plus mélodieuse, Living Ornament se permet même d’inclure de la voix (Edwinrutten), ou d’interférer sur une guitare acoustique et un violoncelle (Hanpeekel), pour des résultats somptueux. Les notes de piano et les voix accélérées de Henkmouwe, le morceau bizarre qui ferme ce maxi, clôt le disque sur une note étrange et suspecte. Un, deux, trois eps dans ta face. “Mortel”. 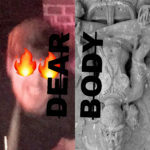 A while ago I reviewed a split LP between Accelera Deck and Living Ornaments (see also Vital Weekly 378). Apperentely with good result for both parties, as now Scarcelight, a small label run by Chris Jeely, aka Accelera Deck, releases a 3″CDR by Living Ornaments. ‘Lumbs’ is the translation of the title of it, and the seperate tracks are named after ‘long forgotten Dutch TV celebrities’ (although ‘Diewertjeblok’ is always my mind, boys). Living Ornaments, a duo of Lars Meijer (who runs the Narrowminded label, who released the aforementioned split LP) and Coen Polack. More so than on the split LP, rhythm plays an important role here. Grainy textures of slowly decaying software is held together by the sticky tape called rhythm. They chop up piano sounds, an acoustic guitar, a broken musicbox in the last piece, and overall a wacky sense of humour makes this into quite an enjoyable release. At times a bit poppy, but never too much or too regular sounding. A fresh approach to the down beat rhythmworld, which lacks humour and which Living Ornaments bring back in. Originally Gone Bald is from Zagreb, Croatia but ever since their start they are from Amsterdam. 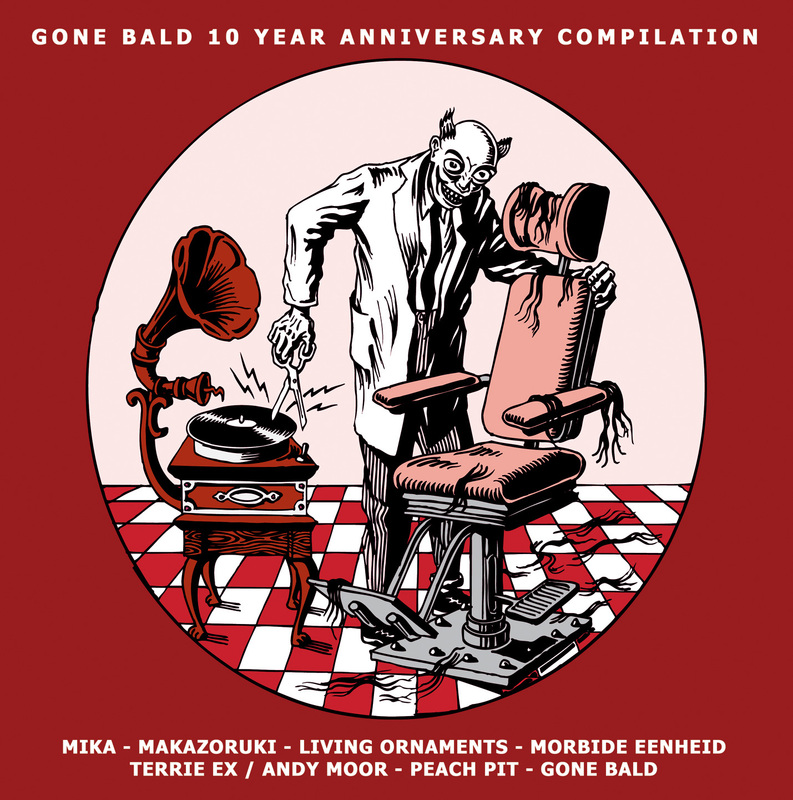 This year they exist for ten years which is celebrated with this compilation of a new Gone Bald track aswell as a host of other Dutch bands. Ten years old but somehow I missed out on them. Gone Bald plays energetic rock music with a lot of wind instruments, at least judging by the fifteen minute track on this CD. I believe the windinstruments are a new feature on this track and they are played by people from the Pink Noise Quartet. Other rocking bands here are Peach Pit, Mika and Makazoruki. Punk is never far away for them, but unfortunally for me it is. Most interesting were Living Ornaments with the electronica experiments (and more regular visitors to Vital Weekly) and Terrie Ex (of the one punkband I like, The Ex) and Andy Moor’s guitar improvisation. It’s to see that Gone Bald have such diverse friends, hopefully bringing the weirder stuff to a wider audience. I hope they have more succes than bringing rock music to me. The computerpride from Hoofddorp brings us a 20 minute long collection of cautious drum ‘n’ bass, nervously crisping rhythmtracks, cut-up guitars, synthetic strings, piano and more nice electronic whims in tracks with titles like Chriettitulaer, Hanpeekel and Harmensiezen. This entry was posted in catalogue and tagged Living Ornaments on November 25, 2003 by admin.